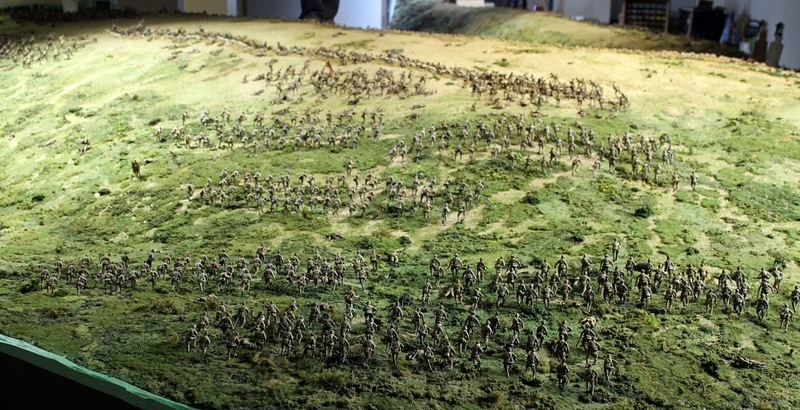 These are the first public photos of the massive diorama of the Battle of Chunuk Bair, which officially opens on Monday morning at The Great War Exhibition in Wellington, New Zealand. 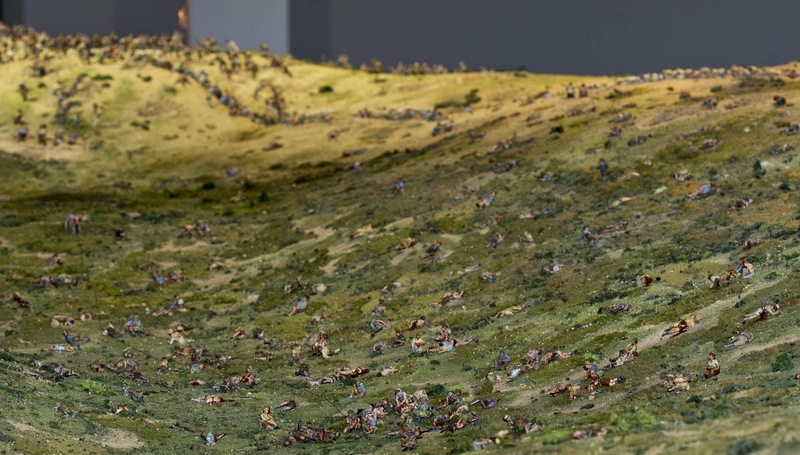 This 10-metre diorama with five thousand 54mm miniature figures commemorates the brave deeds of both New Zealanders and Turks, and the horrors they went through on that August day a century ago. 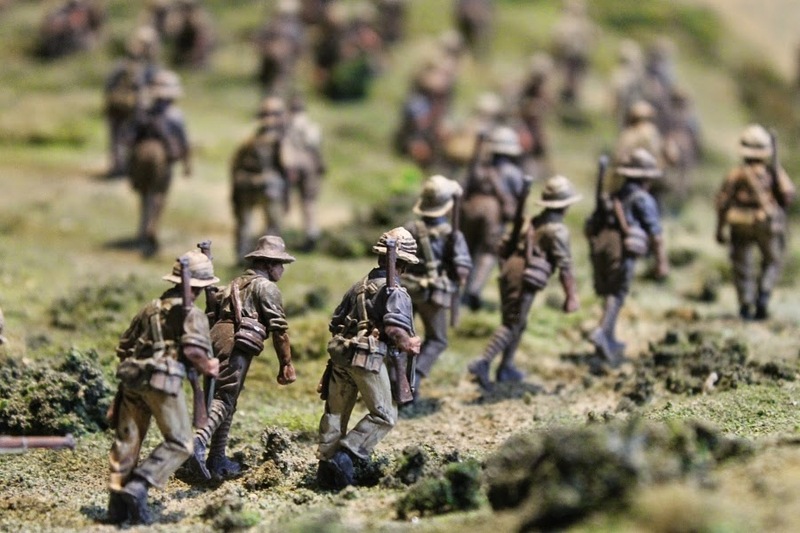 The diorama is situated in the ANZ New Zealand Room, part of The Great War Exhibition at the old Dominion Museum in Wellington. Entry is free. 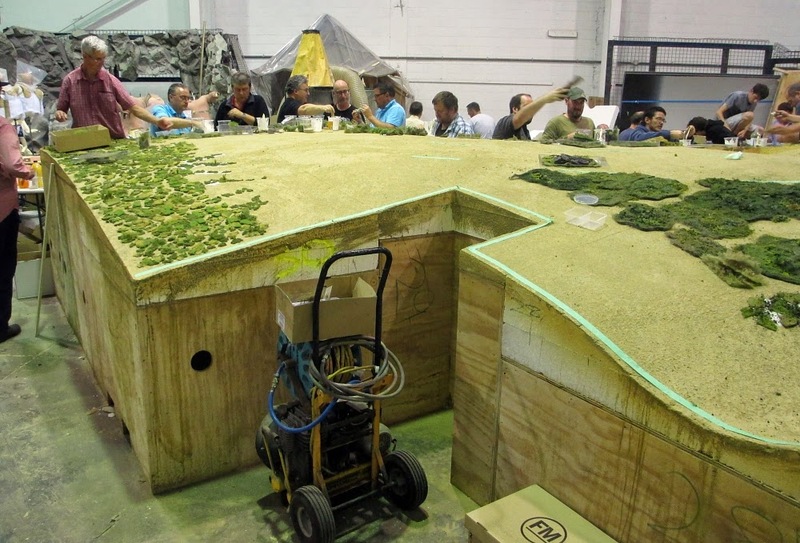 Note: Could I please ask New Zealand wargamers to publish a link to this posting on their club websites, so all 140 volunteer painters around the country get to see these pictures of their handiwork in its final setting. 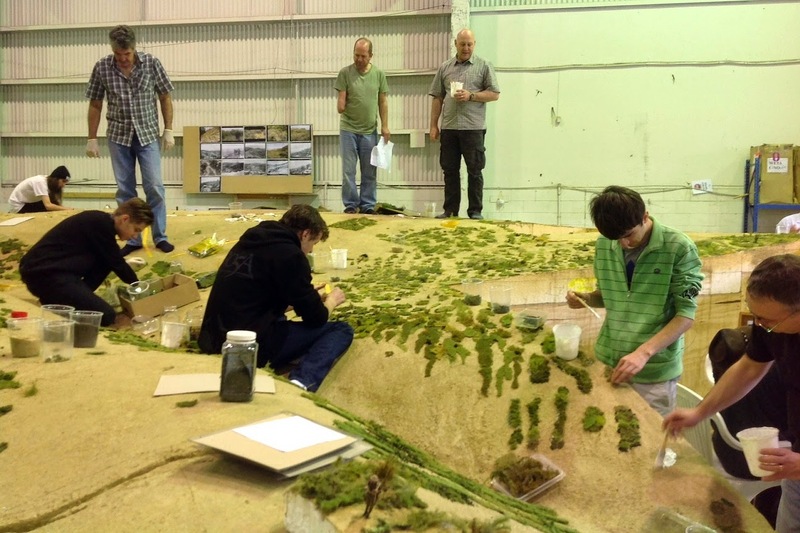 We'll start with a few pictures taken during the construction of the diorama at Weta Workshop in the Wellington suburb of Miramar. At the time we weren't allowed to publish these photos because they showed too much of the diorama or too many figures, which Sir Peter Jackson wanted kept a surprise until after the opening. Don't forget to click on the following pictures to see them at full size. 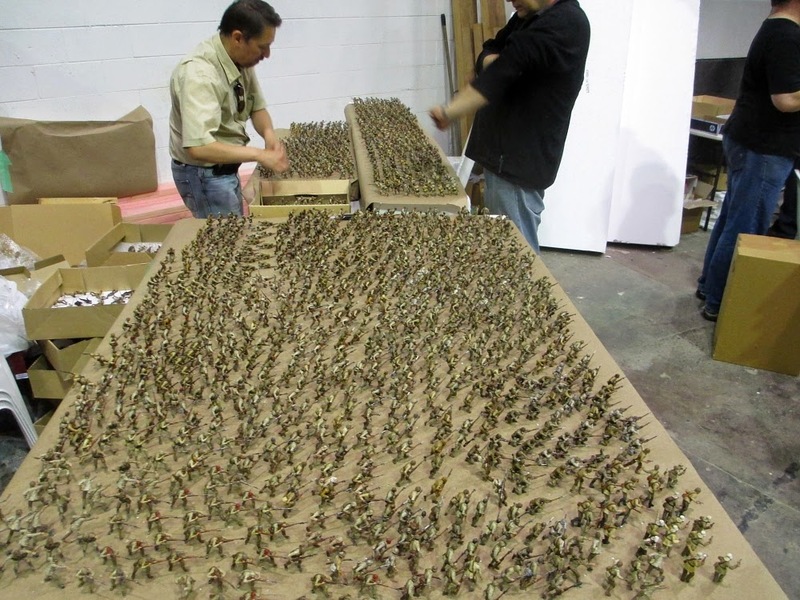 Only some of the thousands of 54mm figures - all of which had to be individually unwrapped after being sent to Wellington by painters from around the country. Each figure was then checked, paint jobs touched up if necessary, dust sprayed onto the boots, and matt varnished. Here are some of the many New Zealanders. 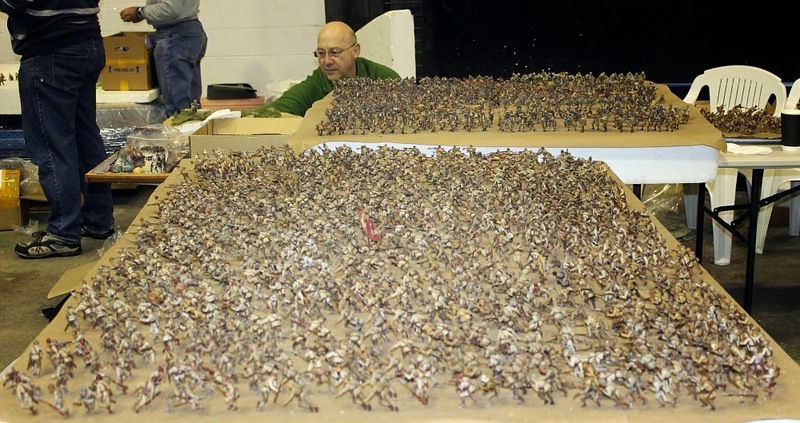 It helped to initially sort the thousands of figures into poses, so that we could then break then into their separate units. Sir Peter Jackson reviews the troops, accompanied by Rhys Jones (aka 'Armchair General', which is a nickname he is fully entitled to, being a retired Lieutenant General in real life! ), and UK sculptors extraordinaire, Michael and Alan Perry. 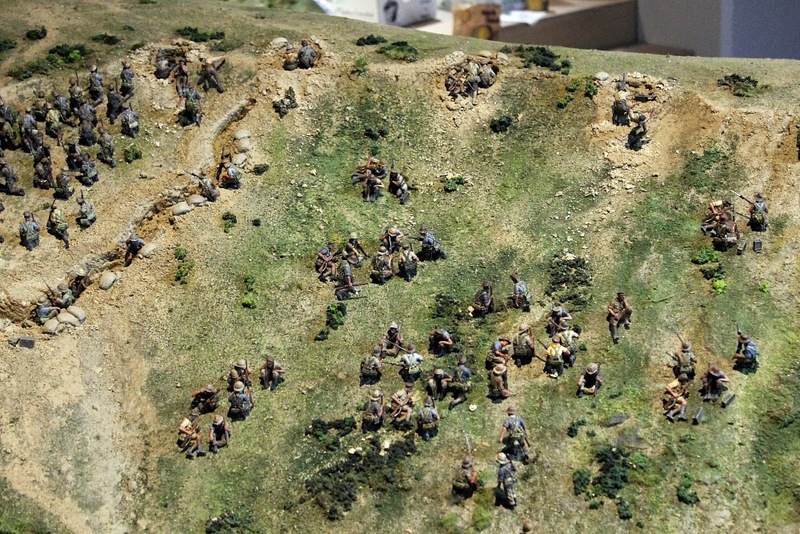 The real terrain around Chunuk Bair was mapped by laser surveying, and the digital map was then used to guide the computer controlled lathe to shape large blocks of styrofoam to form the miniature terrain. 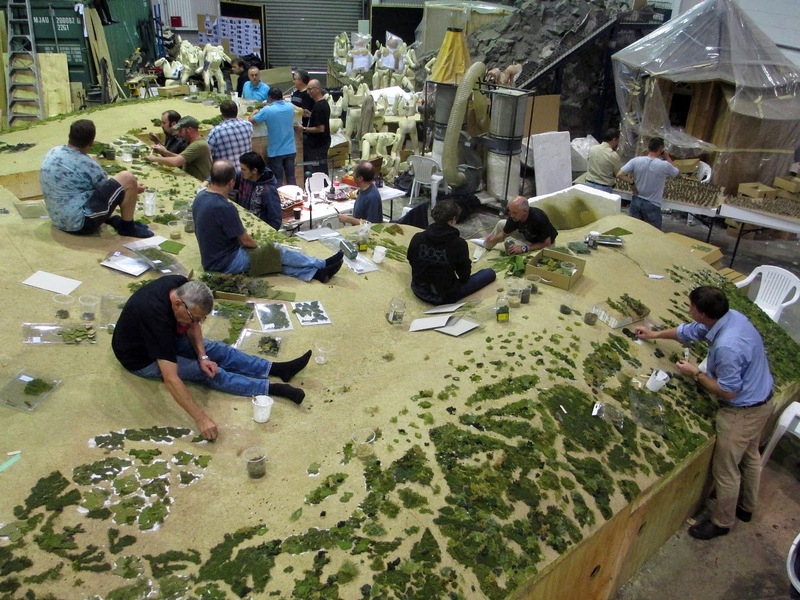 Herman van Kradenburg (Kapiti Wargames Club), Michael Perry (Perry Miniatures, UK) and Rhys Jones (aka 'Armchair General') stand atop the terrain at Weta Workshop, as other volunteers start applying the foliage. On the wall are reference photos of the real-life vegetation at Gallipoli. Even though it looks like a picnic, applying the vegetation to the terrain was a huge job, and took about two weeks. 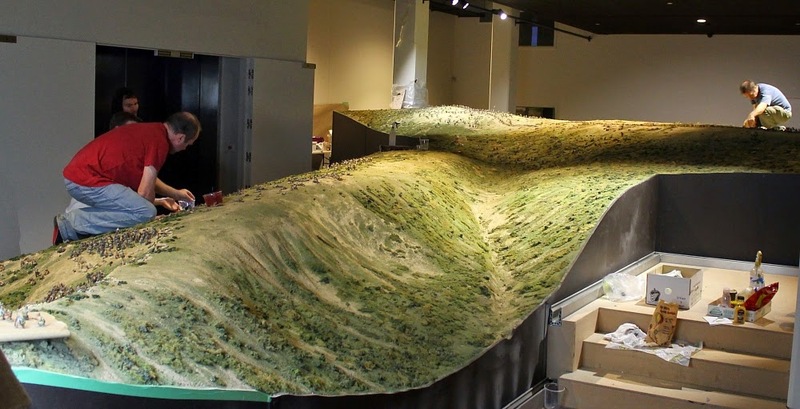 All of New Zealand's model shops must've been denuded of every bit of terrain material they had in stock! 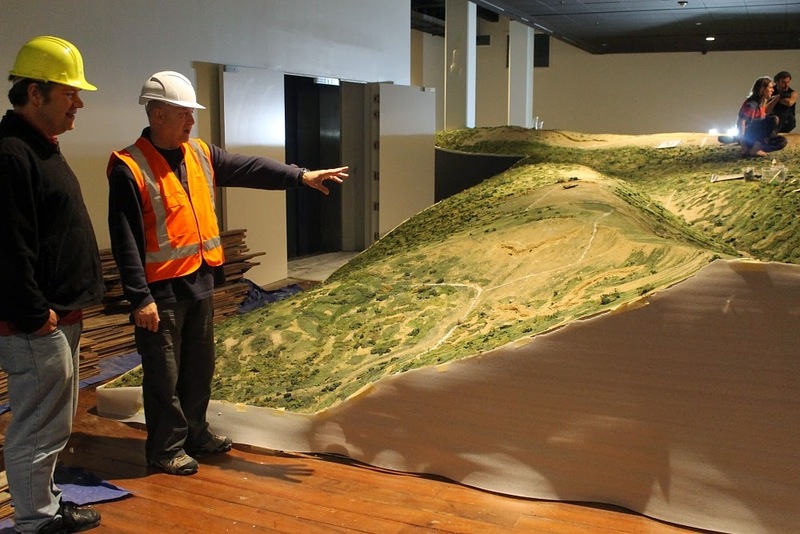 Next we see some photos taken after the diorama terrain was transported from Weta Workshop into its new home at the old Dominion Museum in Wellington. Rhys Jones (Armchair General) points out to volunteer painter Phil Sirvid how the terrain was transported to the museum in blocks sized to fit into the building's elevator. They were then reassembled, and the joins disguised. As this was a construction zone, this must be one of the only dioramas ever where hard hats were required! 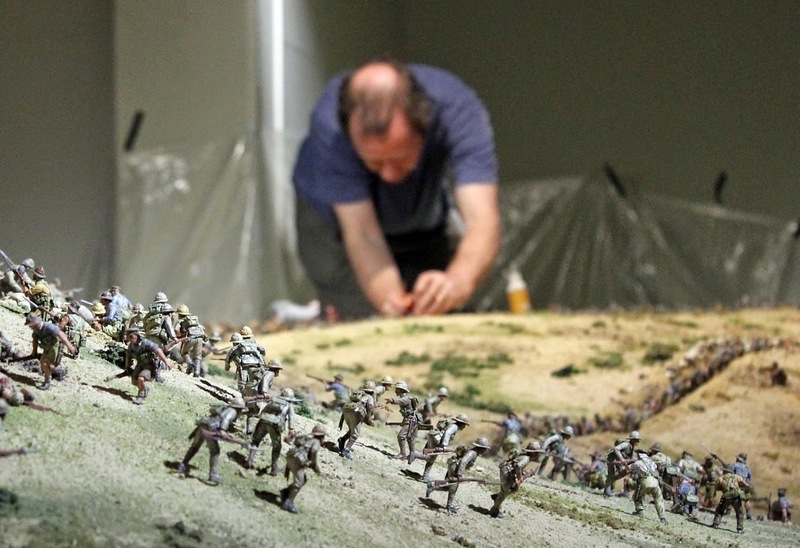 Michael and Alan Perry commence the job of inserting the figures into the terrain. This picture shows only part of the whole diorama! Note the viewing platform, and the tracks for the glass walls that will enclose the diorama. Inserting the figures was back-breaking work. 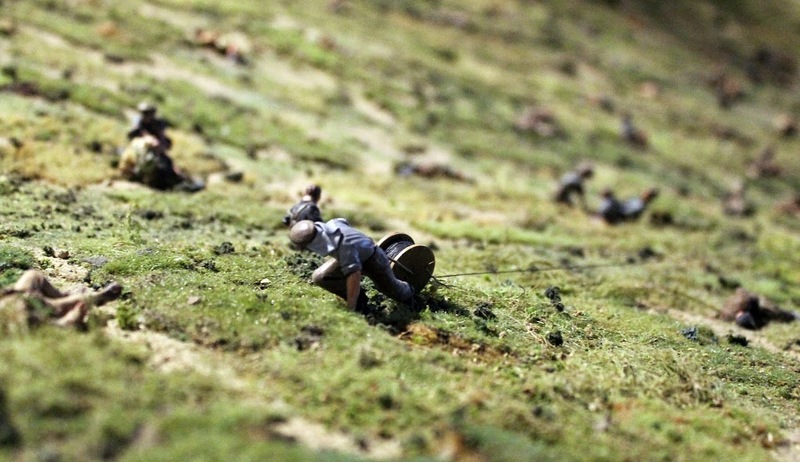 The figures came with a long pin under one foot, which had to be pushed into the terrain. Care needed to be taken to not sit or stand on any figures or terrain pieces. 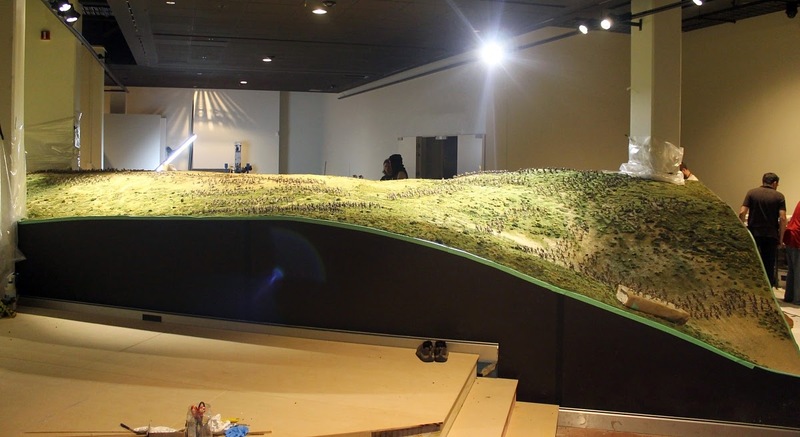 This photo is taken from the rear of the diorama, looking at the back of Chunuk Bair and Hill Q. This is just a small portion of the complete diorama. Alan Perry inserting hundreds of New Zealanders and British into the two trench lines atop Chunuk Bair. High resolution scans of aerial photos taken in October 1915 reveal the remains of the New Zealand trenches, so these are positioned exactly as they were in August. Apart from the first picture, I took most of these pictures a couple of weeks before the opening, when the protective glass walls weren't yet in place. 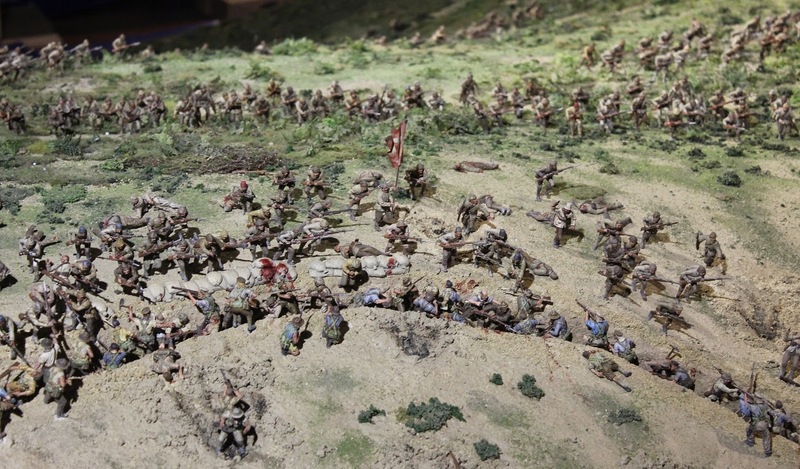 But not quite all the figures had been placed yet, and the final lighting wasn't installed either - so the real-life diorama is even more amazing than in these photos. 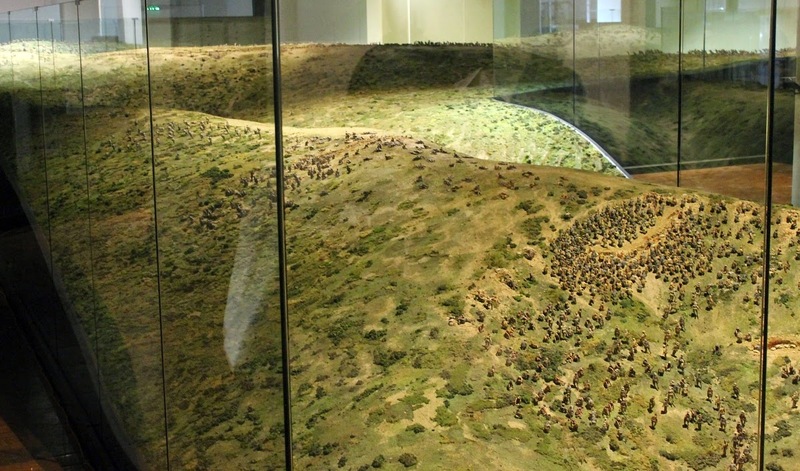 When you enter the New Zealand Room, you are confronted with a massive landscape, estimated at over 10 metres long and just as wide. This photo was taken later than the others in this series, as it shows the glass walls in place. The first part of the diorama you see is a knoll called The Apex. Men of the Maori Contingent rest on the right, whilst at the bottom the first of the reinforcements from the Auckland Mounted Rifles are beginning to arrive. Machine guns line the crest. 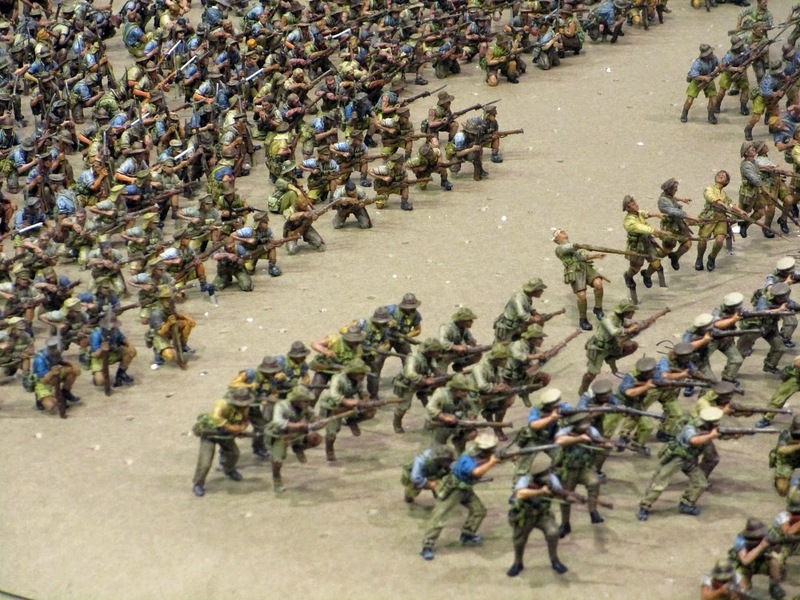 This is one of the parts of the diorama that has been subsequently populated with many more figures since I took this photo. At the foot of The Apex is Brigadier Johnston's rough dugout. You'll see the Brigadier looks a bit indisposed, sitting at the table with his head in his hands. Polite accounts claim Johnston was 'ill' on the night of the attack. Other less euphemistic versions maintain that he was 'fighting drunk'. One of the twelve machine guns that were sited around the crest of The Apex. 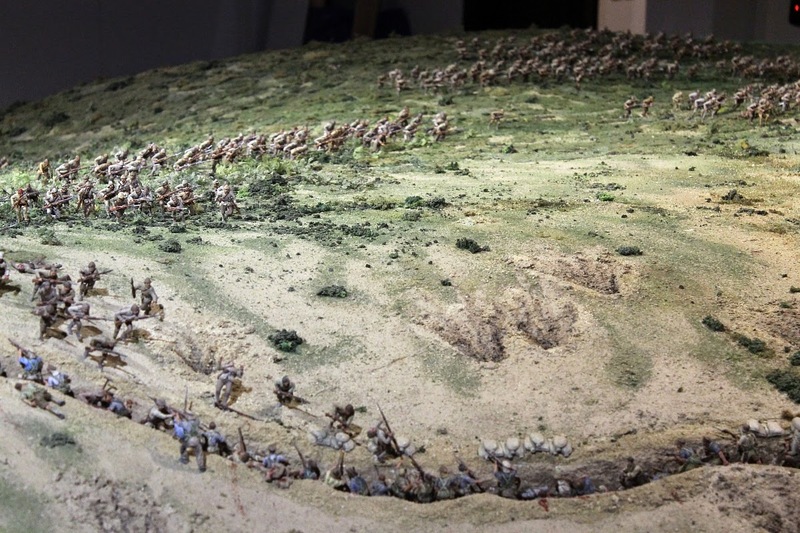 From their positions, they could throw a withering fire on the Turks, but The Apex itself was not safe from Turkish return fire from other positions in the surrounding hills. Away to the right, Turks on Battleship Hill jump out of their trenches to attack the New Zealanders on Chunuk Bair, but many are cut down by the Kiwi machine guns on The Apex. Walking down the side if the diorama, ahead of The Apex we see another group of figures clustered round a knoll called The Pinnacle. Survivors of the previous day's costly charge by the Auckland Battalion have dug in desperately at The Pinacle, surrounded by their casualties. Looking further up the ridge of Rhododendron Spur, we see Corporal Cyril Bassett hauling a telephone line up the hill. In full daylight and under a continuous and heavy fire, Bassett succeeded in laying a telephone line from the old position to the new one on Chunuk Bair. He received the only Victoria Cross awarded to a New Zealander in the Gallipoli campaign. This is where Corporal Bassett is reeling his telephone line towards: Lt Colonel William G. Malone's small command trench, located just below the trenches on Chunuk Bair. Malone, commander of teh Wellington Battalion, was later killed in this spot by friendly fire, either from supporting artillery or possibly naval gunfire. Finally we reach the first of the two trenches on top of Chunuk Bair. This position would prove hard to defend. It was only possible to scrape shallow trenches amongst the rocks. The peak was exposed to fire from the main Ottoman line from Hill Q to the north and on Battleship Hill to the south. Next we see the second trench, being charged by company after company of Turks. Note the shell craters in front of the trench. This trench originally belonged to the Turks, but an artillery barrage the previous night had caused them to evacuate. 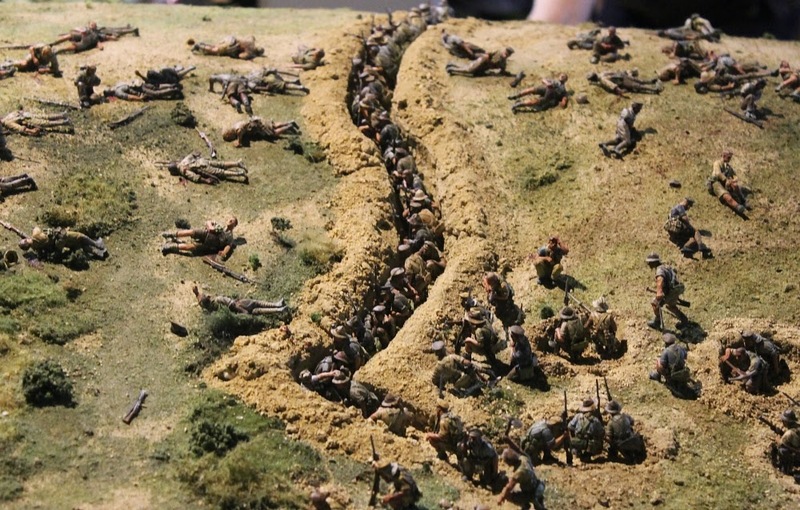 When the Wellingtons clambered up Chunuk Bair at dawn, they found this trench barely occupied, so made it their own. Looking along the forward trench, we can see vicious fighting as the Turks try to re-take their trench from the Wellingtons. Another view of the Turkish attack on the forward trench. Parts of this trench were eventually overwhelmed by the Turkish onslaught, not to mention by the enfilading fire that the Turks could pour into it, especially from Hill Q. Another picture of the trench fighting, as the New Zealanders try to stave off the Turkish attack. Visible on the left, Sergeant-Major Wagner rallies the British 7th Gloucesters, identifiable by their full uniforms and Wolseley helmets. Wagner took charge after every single officer in the unit was either killed or wounded. 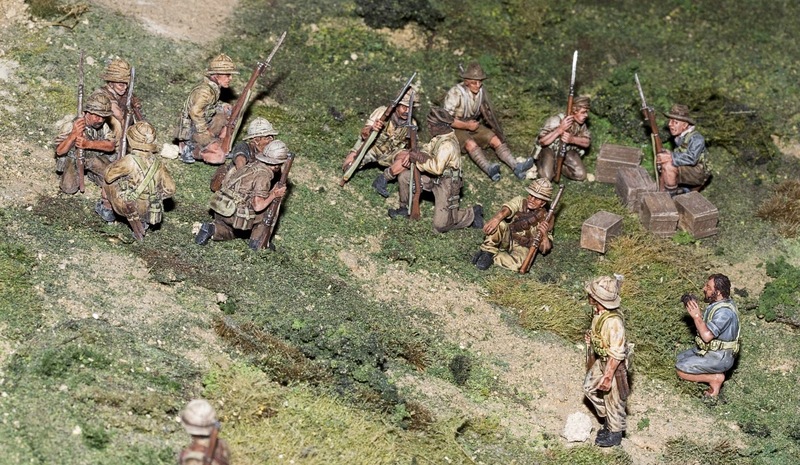 As we step round the back of the diorama, we can see the slopes of Chunuk Bair alive with Turkish reinforcements. Loose formations of Turks charge up the hill towards the forward New Zealand trench near the crest. 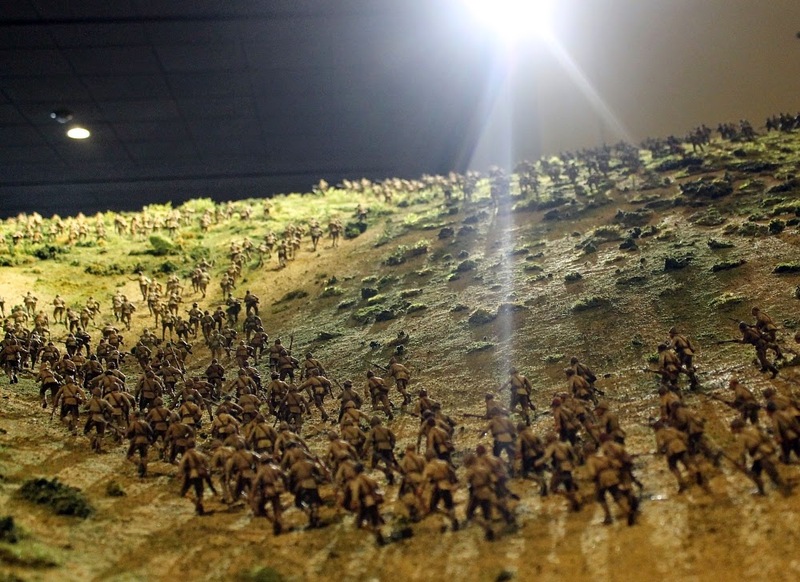 Behind Chunuk Bair, more Turkish reinforcements begin climbing the hill. 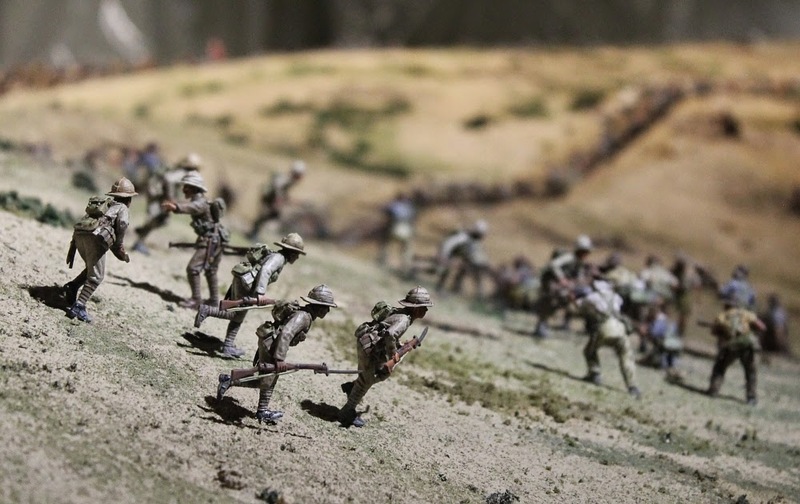 After the Wellingtons were eventually relieved, and after another day of vicious fighting, the Turks eventually over-ran both trenches, and Chunuk Bair returned to their hands for the remainder of the Gallipoli campaign. ... and here are just a few of the hundreds of allied casualties. 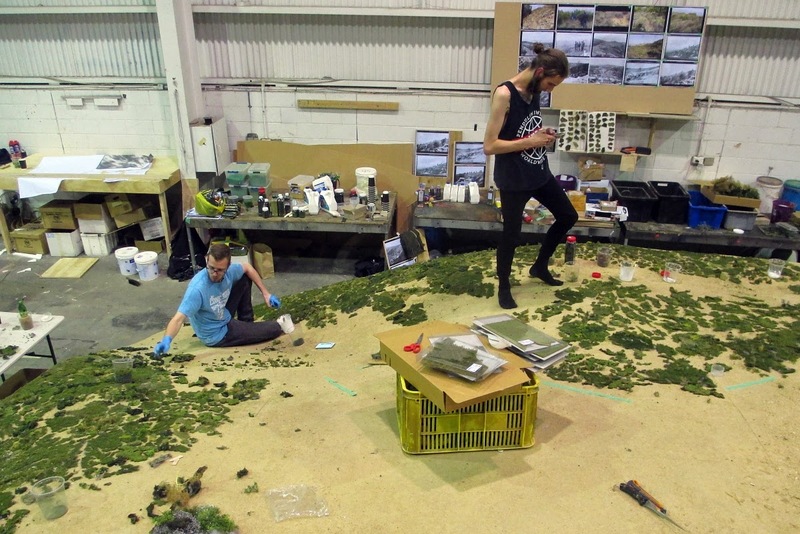 This diorama is not a typical sanitised wargames table. It will be an eye-opener in terms of reality for a lot of people, as you don't normally expect to see so many casualties amongst 'toy soldiers'. 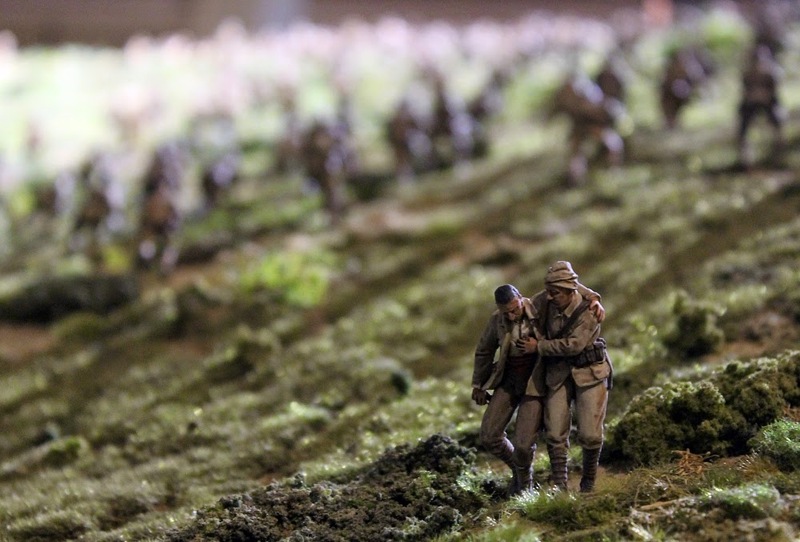 This photo taken by Andy Palmer is the most moving picture I've ever seen of any battle diorama. I had initially ignored this shot as a reject, because it had a lot of out-of-focus foreground. But when I by chance zoomed in on it, the result was unbelievable and harrowing - as you can see in the cropped picture here. If you haven't clicked on any of the other pictures in this blog to enlarge them, this is one you've just got to see full-sized. 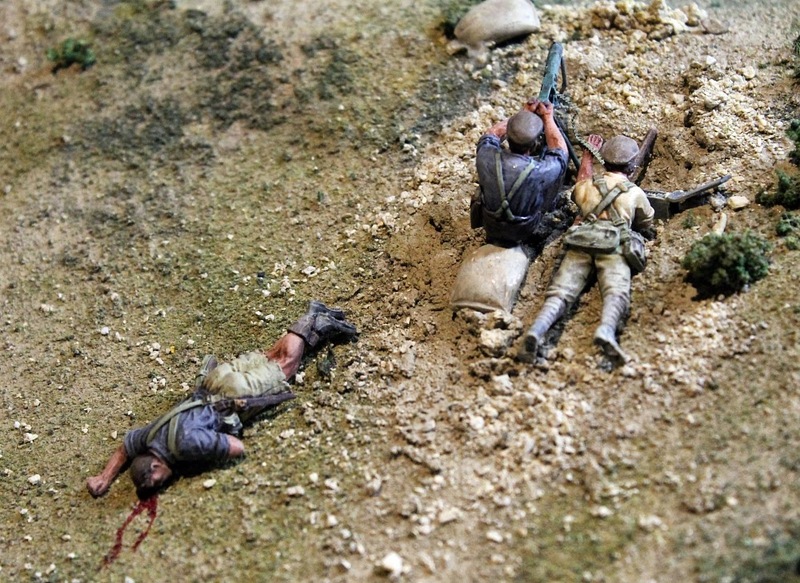 I don't think any other media - photo, painting, film, book - has ever caught the carnage of Chunuk Bair in quite this way. 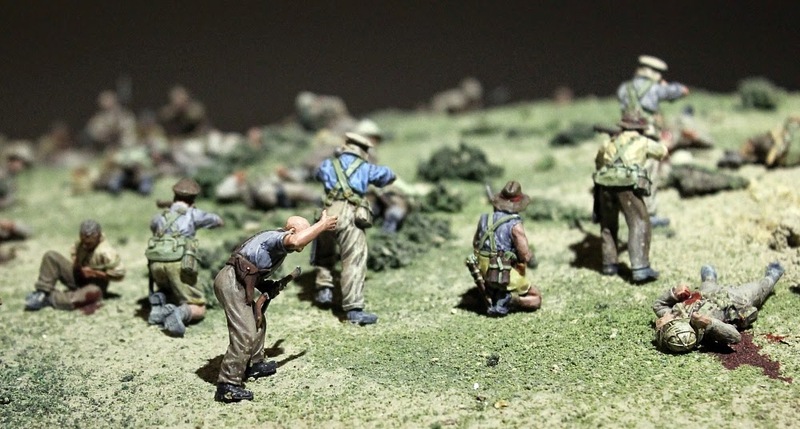 Finishing on a lighter note, the middle guy in this photo is the special figure that the Perrys sculpted of me, directing traffic in one of the trenches. Our Armchair-General (the special model made by the Perry twins of project coordinator Rhys Jones) can be seen waving the troops to move forwards. And what Sir Peter Jackson production would be complete without him doing a cameo? 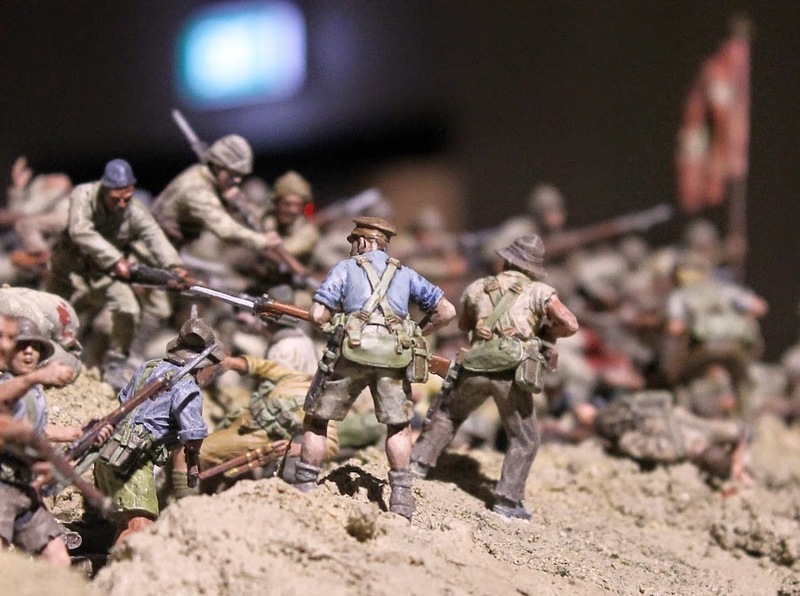 These aren't all the photos that have been taken of the diorama - we've still got a lot more of them kept under wraps for the wargaming press and for an exhibition booklet. Don't forget to also check out the latest news about the diorama. Just amazing. Just back from Istanbul where I saw their 54mm Gallipoli diorama in the Military Museum but this is on a different scale! An absolutely stunning feat. I've been a wargamer for almost my entire life (aided in a huge part by painting Lord of the Rings figures when I was a very young man as Sir Peter Jackson's films were coming out) and I would have loved to be involved in a project like this. I hope one day to come to New Zealand and visit this unbelievable display. Well done to all involved. hey thanks for sharing and making it so interesting with your comment, read everything from A to Z. Which figure is SPJ, they barefoot guy holding the camera I suppose? Wow. I could never have imagined how those figures we painted would look on mass. I can even see one of mine in their. Amazing to see it all together at last, and nice to recognise a couple of mine in those pics. thanks for the photos! Great to see this finally open. Well worth the wait. Thanks for the photo essay Roly. We got to see it on Friday night with the many colour photos surrounding it, it will look amazing today. Amazing, can't wait to see it in person! This looks incredible. I'm looking forward to trying to find some of my guys in amongst the multitudes this afternoon! That looks mighty impressive indeed... I wonder if they use the figures sculpted in the likenesses of the actors who played the Hobbit dwarves? Yes, they're in there. Note was taken where they were, as they would otherwise be hard to find. I can see one, 'Graham', about to punch a Turk in the middle right of the two trench fight photos. Wow! This is simply breathtaking! I am ashamed I dissed Mr. Jackson elsewhere; this is simply stunning work! I think there were some initial misunderstandings on what the project was all about. But the misconceptions gradually disappeared as the true intent became clear. Simply astounding! What a wonderful collaborative effort, congratulations to all involved. Impressive. I'd love to see that in person. Superbly done. 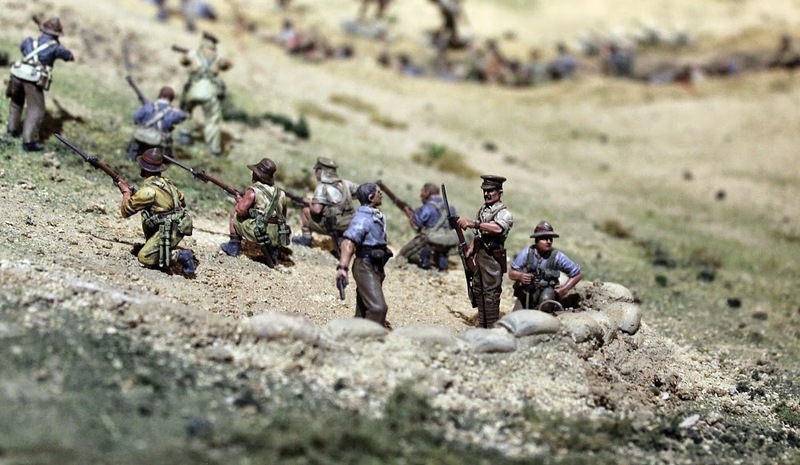 Thankfully I do get to Wellington on occasion so will definitely look forward to visiting the diorama the next time I am over. An unequaled accomplishment. Simply outstanding. Great stuff, very well done! Amazing job. If I ever go to NZ this is one thing I will visit. Fantastic! a real masterpiece of art and love ; that is what this diorama is all about. Congratulations to the Perry brothers , to Mr. Jackson and to all who took part in this amazing project and a thank you all for sharing the story and pictures. An absolutely incredible achievement, from all of the many involved, coordinators, sculptors, painters - and a remarkable tribute to the bravery, sacrifice and courage of the all the actual men involved! Unbelievable and very moving - thanks for your part in making this happen. Those heroes that shed their blood and lost their lives ... You are now lying in the soil of a friendly country. Therefore rest in peace. There is no difference between the Johnnies and the Mehmets to us where they lie side by side here in this country of ours ... You, the mothers who sent their sons from faraway countries, wipe away your tears; your sons are now lying in our bosom and are in peace. After having lost their lives on this land they have become our sons as well. Thanks for sharing that quote - incredibly moving. A hugel impressive effort and wonderful photos and report, thank you. I've done a post on it on my own UK blog. Unbelievable .. I was very impressed ..
Roly I sent you an e-mail. Waiting for reply. Outstanding performance by all concerned! Congratulations on achieving a fitting honour to the Kiwi war effort. An amazing diaroma! Well done to all involved. Right, Can we get an Australia version in Canberra please? Just so incredible it is hard to find the words to truly reflect my thoughts. What an outstanding piece of National and International importance and a credit to all involved. Well done Peter Jackson, the incredible Perry Twins the "Armchair General" and "Arteis" themeselves and all the NZ wargamers who came together to commemorate history and in doing so, created history as well! Cannot wait to get to NZ next year to have a very long look!! We followed any news on that project eagerly. It was an admirable vision by Sir Peter to have it come to life, but in fact it is a memorial to the community of wargamers, modelers and miniature painters not only in NZ. It seems to me that the spirit of an epic project like this and the interest in it by those who are not directly involved but touched by it, do unite the global community of whoever feels affected. I pull my hat to all who contributed! All the time I was reading there was "And the band played Waltzing Mathilda" by the Pogues playing in my head. Totally awesome! Fantastic work everyone involved. Well done! You should be proud. Wow, congratulations on a stunning feat. As a miniature figure painter I am in awe of the accomplishment here. superbe !! Travail impressionnant ! I've been painting model soldiers since I was a kid. I am 60 next year and its still my passion. Seeing this brought a lump to my throat. Forget the yanks overuse of the word awesome. This defines the word. Another one for my bucket list. I must see it. Thank you chaps you've made something beyond special. Absolutely stunning work. Every senior politician in the world should be taken to see it. Waiting for the Balaclava diorama!! Amazing job ! Incredible ! Thumbs up for everyone participating to this project ! Worth the air ticket and the journey to see, awe inspiring. Wow. Seen these pictures here once before but looking them again makes me humbled. Not just all that work that has gone making on this diorama. But seeing and reading all those actions that happened on those days and how men fought, bravely and bitterly, just leave me speechless. Absolutely amazing , take my hat off to all involved. Confused about the origins of WW1? 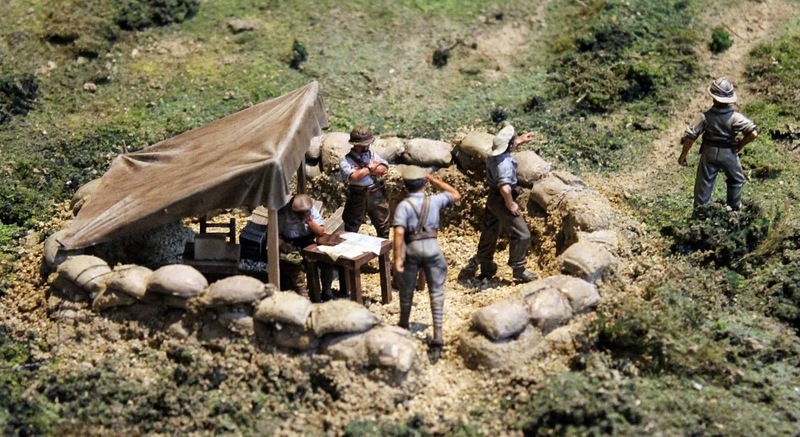 Is this another Gallipoli diorama?